← LOST IN THE RIBBON? – FORGOTTEN COMMAND? While in the middle of a command, you can temporarily turn on a needed OSNAP a number of ways. The most obvious way is to right-click the OSNAP button and then choose the wanted OSNAP. The problem that is most common with this method is that this method keeps that OSNAP on. So after a while, you may have too many OSNAPs on and have to turn some off. 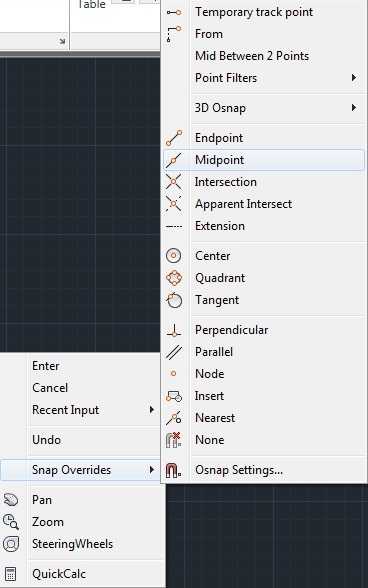 One method is to RIGHT-CLICK while in the middle of a command and select “Snap Overrides” then choose the needed OSNAP. Listed below is a list of these shortcuts. I recognize this is an old post, but just found your blog, congrats……. Many years ago I had a routine that allowed me to quickly select my OSNAPs on the fly by the use of “hot keys”. ALT I for intersection, ALT E for end point, ALT M for midpoint etc. I was part of a package that used Windows “accelerator” routines. Subsequent release of Windows and AutoCAD disabled the accelerators. Ever come across something like this? I use one letter shortcuts in AutoCAD 2006 (old I know, but my company refuses to upgrade!) and I am hoping someone might be able confirm these one letter hotkeys still work with newer versions? It saves you browsing through the menu, and if super quick once you get into the habit of using them. They’re an absolute godsend. The reason I ask is because I’m hoping to recreate these one letter shortcuts into the CUI file for my 2015 Mac version of AutoCAD and just out of curiosity I want to know if it’s possible on newer versions of AutoCAD for Windows too? Thanks Ivan. I’ve since upgraded on Windows and it works a treat. Haven’t tested on macOS yet. Any Idea if there is a toggle to bring back the underscored character version back? My absence from v2012 to v2016 I have noticed that now I have to choose the snap override whereas before all it took prior was to hit it’s activator. Like running ‘Move’… Shift-RMB ‘E’ (For endpoint)… ‘F’ (for From) ‘E’ (Endpoint off another Object)…. 24″ off in some godforsaken direction. The diag box would still come up but was such a much faster process, once accustomated to it, that the diag. boxes became a blur and one never had to look up to even see it. It was really just one fluid command motion that the entire action of whatever one was doing happened in fractions of a second. TIA for anything you may have if this is just a toggled off feature now by default or if they canned it. Hi Doug, bear with me, I’m doing this from memory, so the instructions are vague, but basically you need to dig into your CUI file and find the osnap overrides under mouse actions. For each override you can edit its name: this is the name that pops up in the ctrl-right-click menu (in an active command). If you put parentheses around certain letters e.g. (E)ndpoint or Nea(r)est … then this defines the shortcut hotkey that you can type when the menu is active. It takes a little bit of practice, but holy hell is it worth it when you tap into full fledged beast-mode and become a drafting machine. Thank you Dave. I will also try your tip. I haven’t done any customizing of the mouse so this will be fun. If you want the letters underlined in your menus, it’s actually a Windows setting. Search for “Underline access keys when available” in your system settings and turn it on. And it’s not parentheses ‘()’ that define the shortcut, it’s an ampersand ‘&’. You put it before the letter you want as the shortcut. But you can edit these to be more accessible for quicker drafting.